My research interests center around understanding the consequences of low dissolved oxygen (hypoxia) to ecosystem functioning and organism-sediment interactions (bioturbation). In particular, how perturbations of functions and processes influence energy flow. I am striving to estimate the relative resource value of the various estuarine and marine benthic habitat types and how hypoxia affects energy flows. The goal is to quantify energy flow between habitats and develop environmentally sound management strategies. In addition, I am also interested in the application of the statistical and numerical methods to biological data. I am broadly interested in the ecology and taxonomy of estuarine and marine invertebrates with specialization in oligochaetes. Assessment of the ecological consequences of dead zones (hypoxia or areas of low dissolved oxygen) around the world. Real-time in-situ observation of benthic processes to document rates of sediment transport and bioturbation. 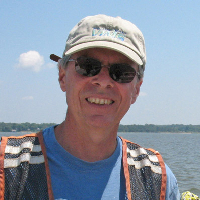 Changes in secondary production and energy flow in Chesapeake Bay related to hypoxia. Biogenic activity in deep-sea sediments. Invertebrate museum curation and collecting. Breitburg, D.L., D.W. Hondorp, L.W. Davias, and R.J. Diaz. 2009. Hypoxia, nitrogen and fisheries: Integrating effects across local and global landscapes. Annual Reviews in Marine Science 1:329–49. Diaz, R.J. and R. Rosenberg. 2008. Spreading dead zones and consequences for marine ecosystems. Science 321:926-928. Brandt, A., A.J. Gooday, S.N. Brandao, S. Brix, W. Brökeland, T. Cedhagen, M. Choudhury, N. Cornelius, B. Danis, I. De Mesel, R.J. Diaz, D.C. Gillan, B. Ebbe, J.A. Howe, D. Janussen, S. Kaiser, K. Linse, M. Malyutina, J. Pawlowski, M. Raupach, and A. Vanreusel. 2007. First insights into the biodiversity and biogeography of the Southern Ocean deep sea. Nature 447:307-311. Diaz, R. J. and J. H. Trefry. 2006. Comparison of sediment profile image data with profiles of oxygen and Eh from sediment cores. Journal of Marine Systems 62:164-172. Lim, H.-S., R. J. Diaz, J.-S. Hong and L. C. Schaffner. 2006. Hypoxia and benthic community recovery in Korean coastal waters. Marine Pollution Bulletin 52:1517-1526. Diaz, R. J., M. Solan, and R. M. Valente. 2004. A review of approaches for classifying benthic habitats and evaluating habitat quality. Journal of Environmental Management. 73:165–181. Diaz, R. J. 2004. Biological and physical processes structuring deep-sea surface sediments in the Scotian and Weddell Seas, Antarctica. Deep-Sea Research II 51:1515-1532. Diaz, R. J., G. R. Cutter, Jr. and D. M. Dauer. 2003. A comparison of two methods for estimating the status of benthic habitat quality in the Virginia Chesapeake Bay. J. Exp. Mar. Biol. Ecol.371-381. Diaz, R. J., G. R. Cutter, Jr. and K. W. Able. 2003. The importance of physical and biogenic structure to juvenile fishes on the shallow inner continental shelf. Estuaries 26:12-20Diaz, R.J. 2001. Overview of Hypoxia Around the World. J. Environ. Qual. 30:275-281. Cutter, R.G. and Diaz, R.J. 2000. Biological alteration of physically structured flood deposits on the Eel margin, northern California. Continental Shelf Research. 20:235-253. Yozzo, D.J. and R.J. Diaz. 1999. Tidal freshwater wetlands: invertebrate diversity, ecology, and functional significance. P. 889-918. In: D.P. Batzer, R.B. Rader and S.A. Wissinger (eds. ), Invertebrates in Freshwater Wetlands of North America: Ecology and management. John Wiley & Sons, New York. Cutter, G.R. and R.J. Diaz. 1998. Novel optical remote sensing and ground-truthing of benthic habitat using the Burrow-Cutter-Diaz plowing sediment profile camera system (BCD sled). Journal of Shellfish Research. 17:1443-1444. Nestlerode, J.A. and R.J. Diaz. 1998. Effects of periodic environmental hypoxia on predation of a thethered polychaete, Glycera americana: implication for trophic dynamics. Marine Ecology Progress Series. 172:185-195. Bonsdorff, E., R.J. Diaz, R. Rosenberg, A. Norkko and G.R. Cutter. 1996. Characterization of soft-bottom benthic habitats of the Åland Islands, northern Baltic Sea. Marine Ecology Progress Series. 142:235-245. Diaz, R. J. and R. Rosenberg. 1995. Marine benthic hypoxia - review of ecological effects and behavioral responses on macrofauna. Oceanography and Marine Biology, Annual Review. 33:245-303. Diaz, R. J., G. R. Cutter and D. C. Rhoads. 1994. The importance of bioturbation to continental slope sediment structure and benthic processes off Cape Hatteras, NC. Deep-Sea Research II 41:719-734.